Thanks to the ornithological monitoring plan at Crystal Rig wind farm in the Scottish Borders, Natural Power is pleased to confirm that four pairs of barn owls bred at the site this year. The ornithological monitoring plan, a document setting out the monitoring requirements as dictated by the planning conditions attached to the wind farm consent, specified the requirement for artificial nesting baskets for long-eared owls which were installed to mitigate against the loss of nesting habitat for this species as large areas of forestry (the breeding habitat for long-eared owl) were felled to allow for wind farm construction. Through the on-going monitoring work, no long-eared owls were found, however, barn owls (birds of open habitats) were known to utilise the wind farm area and breed in the nearby outbuildings. As a result, Natural Power installed three barn owl boxes in various locations around the wind farm to promote the growth of the local barn owl population. 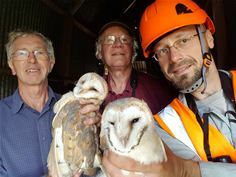 Pawel Plonczkier, Environmental Consultant at Natural Power, said: “The provision of artificial nest sites is a crucial part of any conservation initiative for barn owls, due to modern landscapes offering few nesting opportunities for this species. We subsequently monitored how many boxes were occupied and recorded the breeding success. Of the four pairs breeding at Crystal Rig this year, one pair occupied one of the new boxes, two pairs were resident in a dilapidated farm building and a shed, and one pair nested in an old tree nest box which was installed by Natural Power back in 2014. In early June, a total tally of 12 hatchlings and nine eggs were recorded across the four sites, however, in July it was discovered that one pair sadly produced a clutch of infertile eggs. Three pairs successfully reared their young, with eight chicks still present at their nest sites in mid-July. Members of the Lothian & Borders Raptor Study Group (L&BRSG) were invited to help with catching and ringing the chicks at the last site visit.